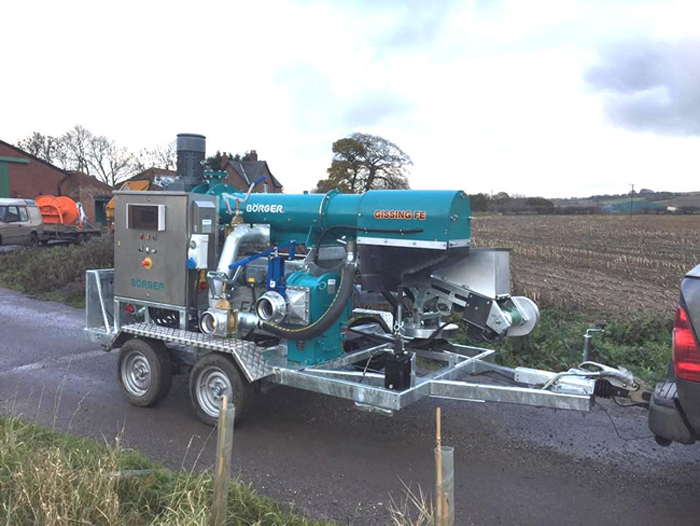 Part of a custom-built container system designed and built by Gissing FE, exclusive distributors of Borger’s equipment for the UK agricultural market, the macerator handles digestate from the farm’s lagoon, whilst the new rotary lobe pumps have replaced inefficient centrifugal units. Requiring just the one generator to power three electric motors, Gissing’s space-saving (20’ by 15’, including pipework) container system reduces emissions for a spreading operation that would usually need two to three large tractors, plus the diesel and manpower to go with it. “Previously,” said Jason Gissing, the farmer had to have three centrifugal pumps in line, which with three lots of fuel, was very inefficient. The impellers on this design of pump will only spin so fast without being able to handle the digestate from the AD plant – and they were also heavy on wearing parts and very time-consuming to service. “However, with the self-priming Borger pumps”, he added, “they hold their pressure much longer to supply a higher volume of slurry – and with their Maintenance-In-Place design, are much, much easier to service – half the time or less than the centrifugal pumps”. To further benefit the farm’s AD plant, Gissing has also designed its bespoke container system so that it can be utilised for spreading as well as stirring the lagoon. The Borger pumps can be started, stopped, revved up and down – all from the operator’s cab – from where the driver can also see what flow rates are being achieved, and if necessary, divert. Gissing’s experience in the UK agricultural market goes back to 1938. The company is a fourth-generation family-owned and run team of specialists.